To acquire a work permit in South Sudan, foreigners have to pay $10,000 now up from about $100, according to local media reports. The directive issued by the Ministry of Public Service, Labour and Human Resource Development became effective March 1 according to the Sudan Tribune. Professionals and/or business class working in South Sudan will pay $10,000, blue class workers $2,000 and casual labourers will pay $1,000. Ugandan and Kenyan nationals will continue to pay $50 for an entry visa and the fate of other citizens in the EAC remains unknown. EAC protocol requires partner states to guarantee the free movement of labour of citizens within the EAC territories. South Sudan is the third partner state after Burundi and Tanzania to fall short of the protocol. The issuance of the directives coincided with the EALA assembly in Kigali. On Mar 6, East African Legislative Assembly (EALA) was opening its fifth meeting of the third Assembly in the Rwanda capital, Kigali to discuss the EAC gender equality and Development Bill, 2016, the EAC Polythene Materials Control Bill, 2016 and the EAC Sexual and Reproductive Health Rights Bill, 2016. This is not the first time S. Sudan comes up with unfriendly foreign policies. President Salva Kiir has faced challenges of addressing xenophobia that recently resulted in sporadic killings and mistreatment of Ugandans. Repatriation of foreigners particularly from neighbouring countries is not a new phenomenon in the country. When efforts by the Ugandan government to settle the violence amicably failed, Uganda was forced to evacuate its nationals following years of discrimination of foreigners. Observers agree that South Sudan’s unfriendly policies against her neighbours might threaten not only the spirit of the EAC integration, but also pose outstanding obstacles to the integration process of the East African countries. 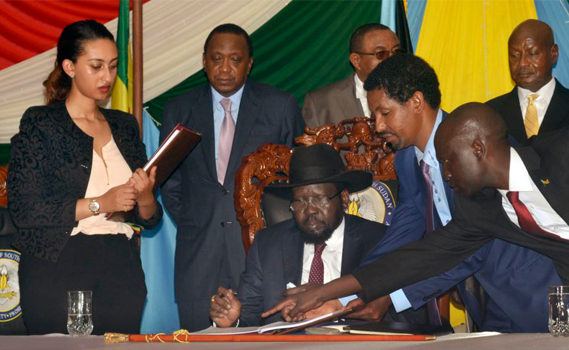 South Sudan gained independence from Sudan in 2011 and the same year it applied for membership in the East African Community (EAC). It became the sixth nation to join the economic bloc on April 15, 2016 when it signed the accession treaty in the Tanzanian commercial capital, Dar Salaam. After two years of existence the latest entrant to the EAC bloc hosted civil wars that resulted in the signing of a peace deal in 2015.